I am sure one of the photos here will be familiar to some of you – this is Akello Catherine, a good Acholi friend of ours who recently had baby Daniel (named after Dan). I taught with Catherine for a year and a half at Layibi Techo and we team-taught remedial phonics together. She is a great teacher. Catherine has now joined me in the afternoons for teacher training and she adds a new element to these workshops. Catherine is extremely encouraging and motivating to the other teachers – it is great for local teachers to see another local teacher (not just this white-faced foreigner) teach them, I can see them thinking that they too can teach like this and many of them want to ‘be like her’. On two separate training occasions she even taught her own teachers, teachers who had taught her in P7 (year 6), and instead of there being any resentment these older teachers were extremely proud of Catherine and eager to learn new things from her. 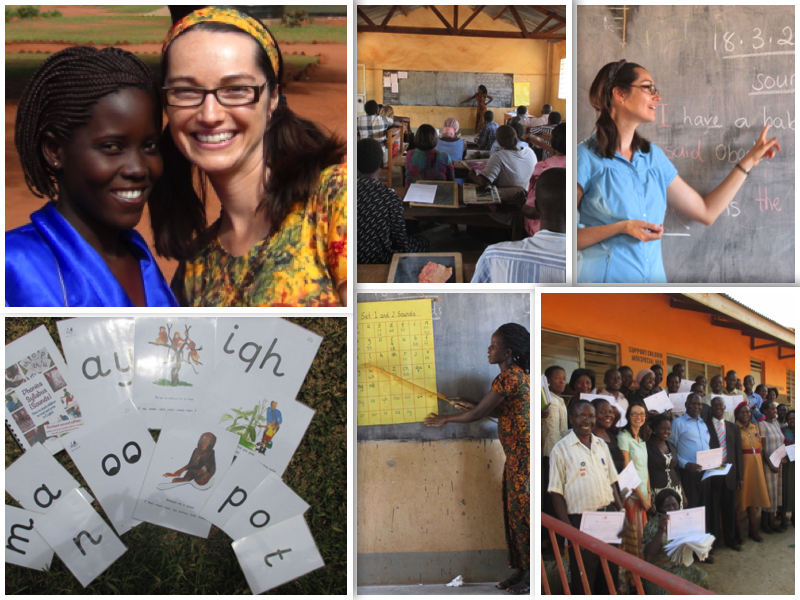 The photo above shows Catherine and Jody; some of our teaching resources; Catherine and Jody teaching at a recent workshop; and also the group of teachers we recently trained from Gulu Prison Primary School (no, none of the children are inmates :). At this school the teachers were particularly engaged in the training and it was wonderful to teach teachers so willing to learn new things (they were like sponges) and who were extremely grateful. Posted by Dan and Jodes on 28/03/2015 in Uncategorized and tagged Gulu, phonics, primary school, remedial, teacher training, teachers, workshops. Wonderful news Jody. God has really blessed your work in marvellous ways. Glad you now have company and encouragement in your work.